A couple of rookie head coaches will get their first taste of the local rivalry between the Raiders and 49ers when the two Bay Area inhabitants square off in a preseason clash Saturday at Candlestick Park. Both teams underwent changes in leadership this offseason in an attempt to end lengthy playoff droughts, with the 49ers reeling in former Stanford head man and NFL quarterback Jim Harbaugh and the ever-changing Raiders replacing Tom Cable with esteemed play-caller Hue Jackson, who had joined the organization last year as the team’s offensive coordinator. Neither coach’s first game in charge at the pro level produced a desired result, with Jackson’s Raiders dropping a 24-18 decision at home to Arizona last week and Harbaugh’s 49ers suffering a 24-3 defeat at New Orleans in their 2011 preseason opener. Oakland received a solid performance from starting quarterback Jason Campbell in Jackson’s head coaching debut, but a defense that lost All-Pro cornerback Nnamdi Asomugha to Philadelphia in free agency was lit up for 297 passing yards and three touchdowns through the air by the Cardinals. Campbell directed the Raiders’ first two offensive series in the game and completed 6-of-9 passes for 66 yards, including a 23-yard strike to new tight end Kevin Boss that set up one of four field goals by kicker Sebastian Janikowski on the night. Jackson’s offense, which finished second in the NFL in rushing yards and sixth in points last season, will be without a few key cogs for this contest. Standout running back Darren McFadden remains sidelined due to a fractured orbital bone suffered in practice, while wide receivers Jacoby Ford (broken hand), Louis Murphy (hamstring) and Chaz Schilens (knee sprain) all aren’t expected to play. The injuries at wide receiver should provide more of an opportunity for rookie Denarius Moore, who’s put together an outstanding camp and led the Raiders with three catches for 37 yards against the Cardinals. Harbaugh enters Saturday’s tilt with some work to do following San Francisco’s uninspiring overall performance versus New Orleans. The offense was particularly shaky, managing a total of just 234 total yards and surrendering six sacks to an aggressive Saints pass rush. Veteran quarterback Alex Smith hit on only 2-of-7 passes for 10 yards and was sacked twice in four first-quarter drives that all ended in three-and-outs. Rookie backup Colin Kaepernick also struggled in his first pro action, with the athletic second-round pick completing 9-of-19 throws for 117 yards and two interceptions while also fumbling twice in relief of Smith. One bright spot for San Francisco was the play of rookie outside linebacker Aldon Smith, the seventh overall choice in this past April’s draft who amassed five tackles, a sack and forced a fumble while operating with the second-team defense. On the injury front for the Niners, wide receiver Michael Crabtree has yet to be activated from the physically unable to perform list due to a lingering foot problem that may keep him out for the entire preseason. These teams last met during Week 6 of the 2010 regular season, with San Francisco coming away with a 17-9 win at Candlestick Park behind a 149-yard effort from running back Frank Gore. The 49ers also prevailed in last year’s preseason clash with Oakland, producing a 28-24 victory at the Coliseum to even the all-time exhibition series between the clubs at 19-19. 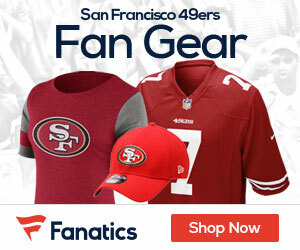 Be the first to comment on "Niners Host Raiders in Second Game of the Preseason"